Another smart idea is to do some research and find the source of your water. If you live on a rural property, you may already know your source if it’s a well on your land. For those who don’t have a well, it’s important to find out exactly where your water service is sourced from. Some city water services use a local reservoir for residential water. Other places may source their water from rivers, bays, or lakes. You can also instantly improve the taste and composition of your water by installing a filter on your tap. If you want to control your entire home’s water system and improve the quality, a whole-house filter may be the best solution. If your water has problems, a filter may be a great way to remove pesticides, chemicals, lead, and other contaminants. For smaller filters on your faucet, you’ll need to periodically replace the filter so it is consistently effective. Additionally, you can help support global efforts to conserve water by learning about water improvement plans, such as the Cadiz Water Project. At home, teach your children about the importance of saving water and model good water habits. When brushing your teeth, turn off the tap. Stop washing your car every weekend and eliminate any wasteful habits. Avoid taking long showers and start collecting rainwater outside for use in your garden or lawn. If you’ve installed filters, tested your water, and checked out the source, and you still have issues with the taste or quality of your water, here’s what you can do. Make sure you primarily run your water cold and avoid using hot water for things such as cooking, mixing, and drinking. If you need hot water for tea or for boiling, rely on your stove or microwave to bring the water to temperature. Sometimes, pollutants like lead can leach into hot tap water more often than cold. The last step to take if you still aren’t satisfied with your home water quality is to begin a treatment plan. You’ll need to work with an expert to get the right combination of additives to make your water better. Many people choose to add a water softener to their system to make it easier to wash and rinse things off. You can also invest in a water purification system for your home, but that can be costly. A well contractor or plumber may be able to help treat well water for your home. 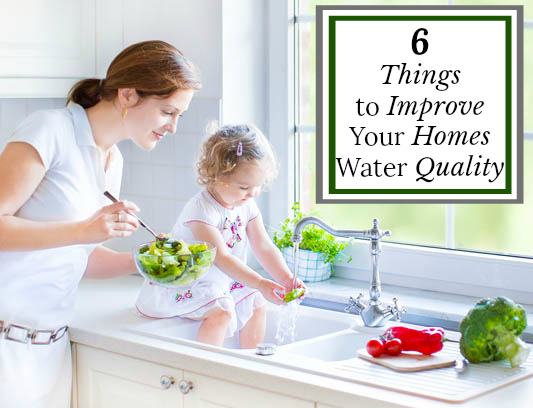 Don’t ignore the water quality in your home. There are plenty of simple actions you can take to improve your water and give your family a healthier lifestyle. This way, you don’t have to worry about the potential health risks of poor water quality.